Volunteer to Host an Event! Every summer, FBC devotes intentional time and energy to building community, relaxing together and getting to know one another -- newcomers and long-timers alike -- in new and fun ways. Two Summer of Fun events are planned for June with more gatherings later in the summer (TBA). If you'd like to organize and host an event, reach out to Faith Formation Team leader Lucy Plovnick (lplovnick@verizon.net). Some events are free; others require purchase of a ticket payable below; if online payment isn't your thing, just call our office at (202)387-2206 and Zena Aldridge will be happy to assist you). 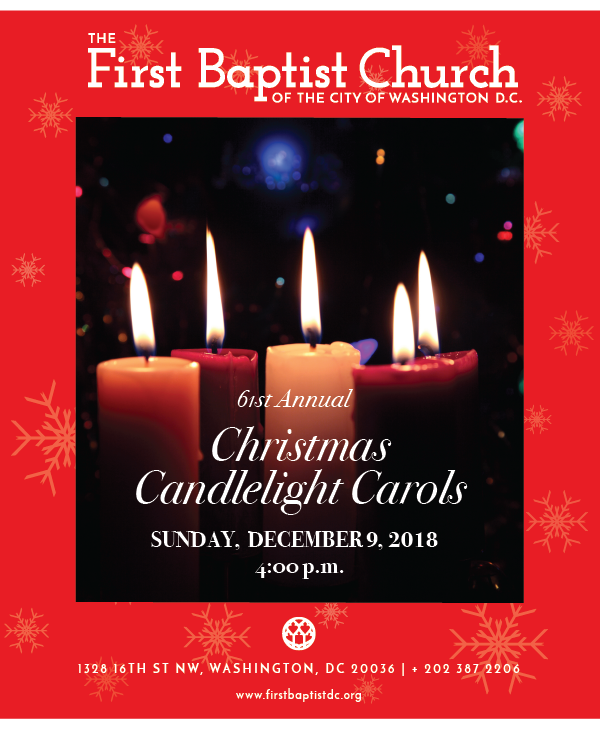 The Congressional Chorus (including FBCDC's own Philip Hawkins) will perform at 7:30pm, at National City Christian Church (5 Thomas Circle, just blocks from First Baptist). The program, titled “Let Justice Roll: From Montgomery to Selma to Birmingham,” features ground-breaking musical works that shed light on the long and painful history of racial inequality in the United States and celebrate the people who have worked to bring justice, freedom and hope to everyone who calls this nation their home. Deadline to RSVP and pay HERE: Friday, May 17. And, if your schedule allows, join us for dinner before the concert at 5:30pm at a nearby restaurant TBD. Questions? Contact Amanda Tyler at amanda_tyler@hotmail.com. Game starts at 4:05pm. $28.00 per ticket. Deadline to RSVP and pay HERE: Friday, June 7. Questions? Contact Lucy Plovnick at lhp@msk.com. 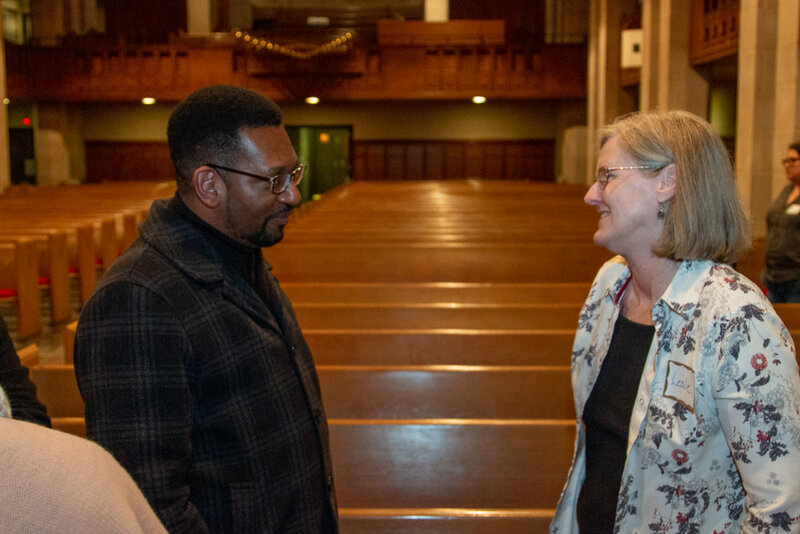 In November of 2018, twenty-two men and women from First Baptist Church and Nineteenth Street Baptist Church met for prayer, conversation and the planning of joint ventures between our two churches in the areas of worship, social & racial justice, and the writing of a new, combined history. 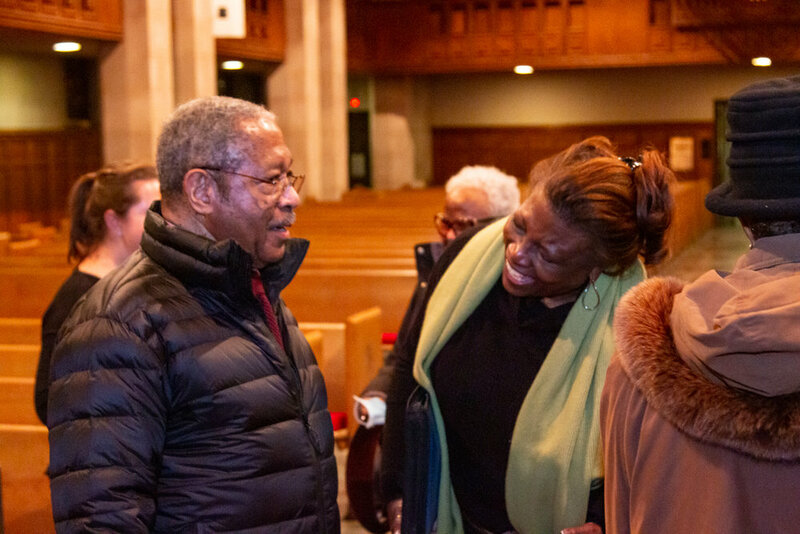 On Wednesday evening, February 27, FBCDC hosted supper and the second meeting. “Remember you are dust, and to dust you shall return” (Gen. 3:19). For nearly a thousand years, these words have been spoken to believers as the sign of the cross is traced on their foreheads with ashes, a sign of our mortality and repentance. Join us March 6th at 7pm for the Ash Wednesday worship service (Dinner at 6pm, catered by Chef Laval). 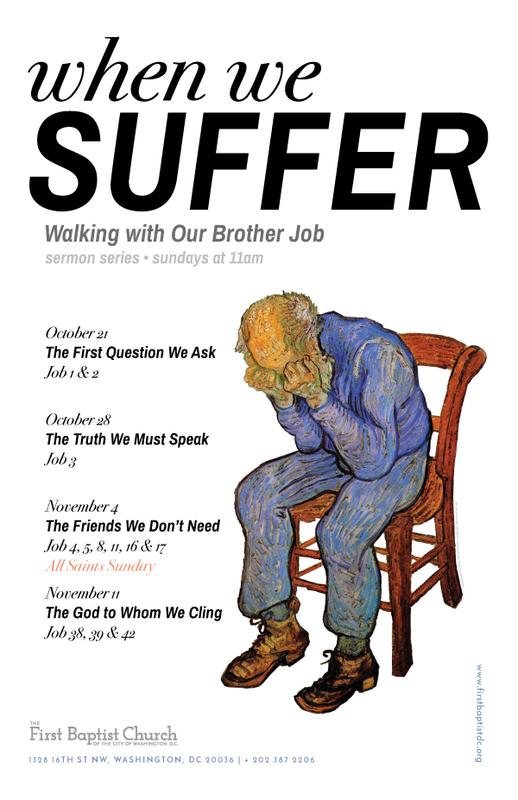 Can’t make it to the evening service? Pastor Alyssa will offer ashes on the front steps of the church (16th Street) that morning from 8am until 10am. 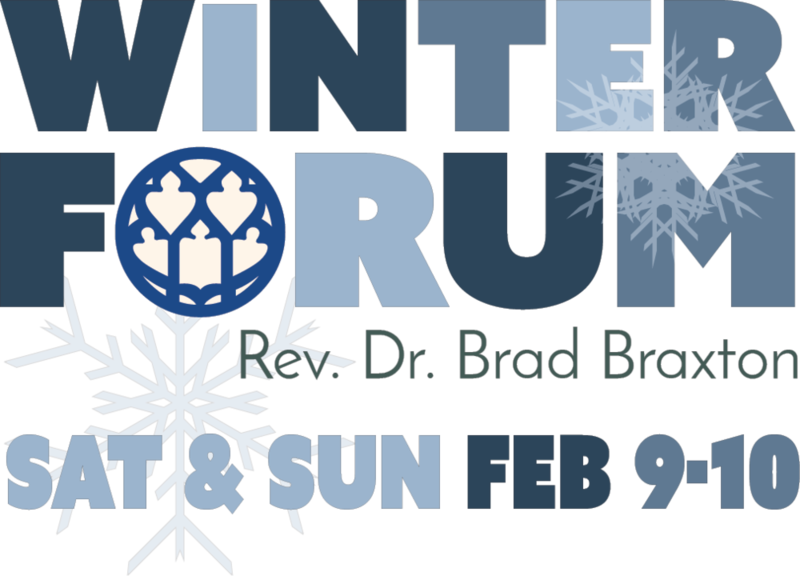 Our pastoral staff, deacon chair, moderator and other church leaders have been in communication this afternoon and we have made the decision to cancel all Sunday activities for tomorrow, January 13. Up until a few hours ago, when only 1-3 inches of snow were predicted, the plan was to meet for worship as usual. However, now that the forecast calls for greater amounts of snow, and because some of our Sunday support staff live beyond the District, we feel it best to suspend Sunday activities and land on the side of safety. On the left side of our Facebook page you’ll see a list of options. Click the “Videos” button. The live session begins at 11am. the broken lawn chair you forgot to take in last fall. shimmering and white as it falls. in silence so deep that you can hear its silence. Stay warm and be safe, friends. Savor the quiet beauty falling all around you. And be mindful of those who are seeking warmth and shelter tonight. We gather on Christmas Eve to celebrate the birth of Jesus Christ, the light of the world. Join us for this beautiful hour of worship featuring special elements for children, a reading of the Christmas story, the music of pipe organ and choir, and a Christmas Eve meditation. We conclude the service with the lighting of congregational candles. 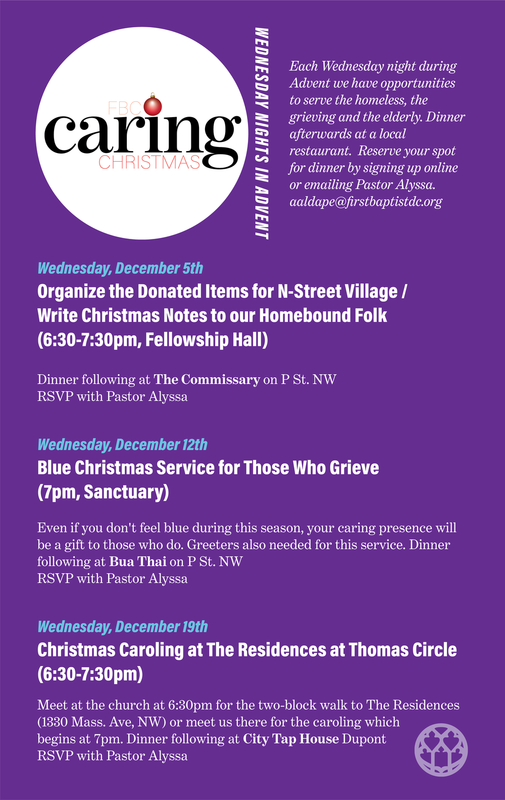 The First Baptist Church of the City of Washington, D.C. • 1328 16th Street NW Washington, D.C.
Poinsettias and fresh greenery will decorate our building during Advent! 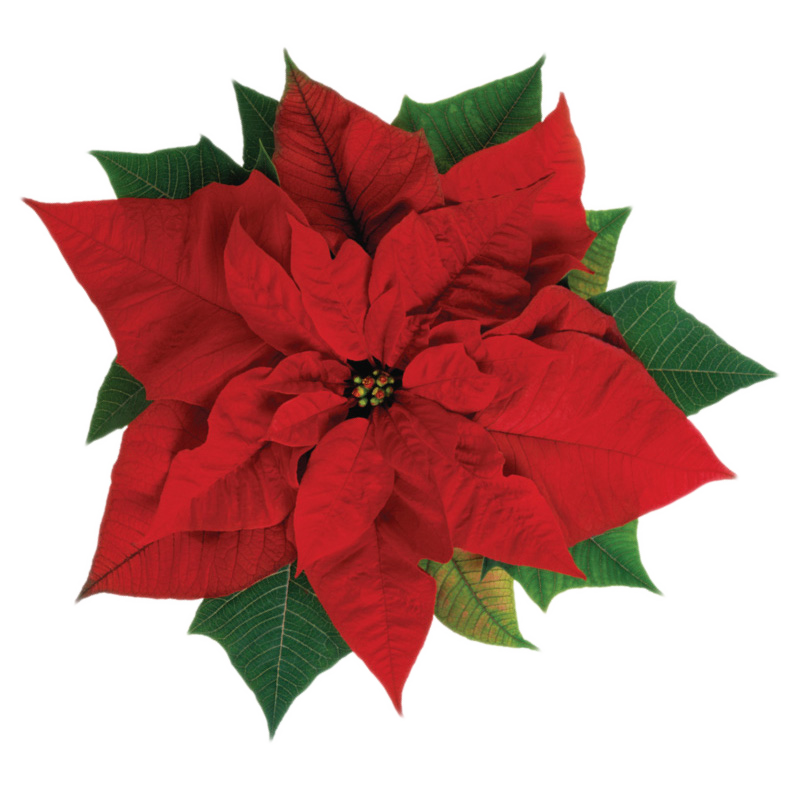 The poinsettias will be displayed starting the second Sunday of Advent (December 9) and will be available to take home after the Christmas Eve service.